Let me first tell you that I know next to nothing about products and this is my opinion. For most men like myself, we are not used to putting things on our face or skin. It feels weird and it's sticky all day long. I hate putting products on my skin. I would rather have dry skin. Not only that, even when I do manage to ignore the feeling of lotion on my face, I have to wash my hands because my palms were just too sticky. Well I have been on Accutane for 3 weeks now and it is just beyond what a normal dry should be. The recommended moisturizer is Cetaphil but it was like putting oil on my face. It looks shiny and it is sticky even hours after the application. So, I didn't even moisturize. I couldn't stand the feeling of it on my skin, not even on my legs or arms because I would feel it when I rub against objects. That is until a co-worker gave me a sample moisterizer she got from the mall or something. My chin was flaking badly at work. It was Cerave! It goes on and absorb so quickly you would forget you had lotion on. So I went to the store to see if the real product would do that. I open the jar and moisterized my left hand. A few seconds later it felt like nothing! Even my palm felt light and normal! So if you're a guy like me. This is the best product for you. I am totally with you my friend. For my entire life I have hated putting any kind of lotions or creams on me. My issue with it is exactly as you explained.....sticky, greasy, yuk feeling. I would rather have dry skin too. A few weeks ago I was diagnosed via biopsy as having a skin disorder called Grovers disease. The ensuing "rash" is sometimes triggered by skin dryness so I have been forced to start using moisturizer on my back & chest. 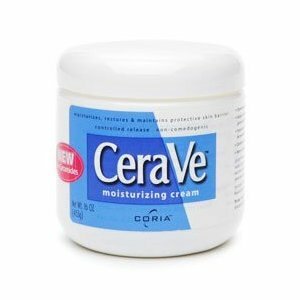 After researching and reading reviews I got onto the CeraVe as well. I have been using the moisturizing lotion in the pump bottle for a couple of weeks and have to agree with you that it is a good product. I think the lotion is lighter than the cream version and you might like it. Anyway, thanks for giving me a smile this evening. Peace out.